This week, Bigfoot invades the found footage sub-genre with Bigfoot: The Lost Coast Tapes, a title we’ve been covering here on ShockTillYouDrop.com for a bit now. The film enters a limited theatrical run today (Friday, October 19th) and we had a chance to briefly speak with director Corey Grant. 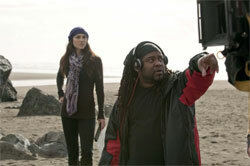 Bigfoot: The Lost Coast Tapes picks up after a “Bigfoot Hunter” claims to possess the body of a dead Sasquatch. A disgraced investigative journalist stakes his comeback – and the lives of his documentary film crew – on proving the find to be a hoax. Shock Till You Drop: Let’s talk Bigfoot. Growing up, where did you fascination with this creature begin? Corey Grant: Six Million Dollar Man. [laughs] Very serious. That was the first time I ever knew about Bigfoot. Shock: Nice! Okay, so where did The Lost Coast Tapes come from for you…beyond your passion for the Six Million Dollar Man? Grant: Well, I’m a big fan of Bigfoot. Anything supernatural, I would watch and research. Then, two friends Bryan O’Cain and Brian Kelsey, who wrote the script, Kelsey grew up where a lot of Bigfoot sightings occurred. His family owns this cabin deep in the woods and he said, as a little kid, he would remember Bigfoot footprints he would take pictures of. So, he came up with a treatment for the script. And we thought about doing a good story that stayed true to the actual story and that it would be a no-brainer. It just snowballed into getting the movie made. Shock: Did you determine early on that it would be a found footage film? Grant: I’m more of a traditional filmmaker and the only found footage films I had seen were The Blair Witch Project and Cloverfield. I wasn’t so much a fan of found footage until last year. We went back and forth with the script on this – going between traditional narrative and found footage, but we wound up making it a part of the script. We then did traditional and found footage, but wound up cutting out all of the traditional stuff because it just didn’t work. With the found footage, it had to be very well choreographed. It looks random, but the shots we had were very well crafted to get the compositions that I wanted. Shock: Did you personally get in the mix with your actors to heighten the energy, scare them a bit and capture the moment? Grant: Well, most found footage movies are a lot of improvisation. I improv movies, so in terms of the actors and bringing them on board, there was a script, but I wanted tem to have improv skills so they felt comfortable embellishing and improving on what we had. Then we just tossed them into the elements. That was a real cabin in the forest and the elements were crazy and it got them in the right head space. 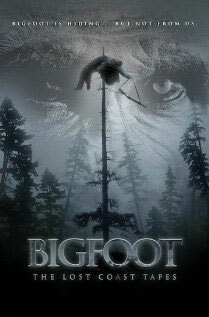 Shock: Bigfoot is sort of hard to pull off on the screen – did you find it a daunting task to try and make him scary again? Grant: Let me tell you, that was one of the hardest things. One of the big things about horror is the music and in found footage films, you shouldn’t have that. So a lot of scares can come from the music and because we didn’t have that, it was hard. Then, to be able to get yourself into the mind of the viewer was hard. We used deception, shadows, every element we could to put the viewer in the environment. I don’t think this is a traditional horror film, but it’s got horror elements. I look at this as a story with thriller/horror elements. Shock: Are you considering a sequel? Grant: It was set up that way, but it’s definitely going to happen. The thing is whether we do something traditional or more found footage. The thing is, I didn’t know there were that many found footage films coming out now and that there was a stigma coming with it. Now I have to fight around it and that’s a bummer. It’s going to happen, we’re just not sure what style it will be yet. Stay up to date with the latest horror news by “liking” Shock Till You Drop’s Facebook page and following us on Twitter!